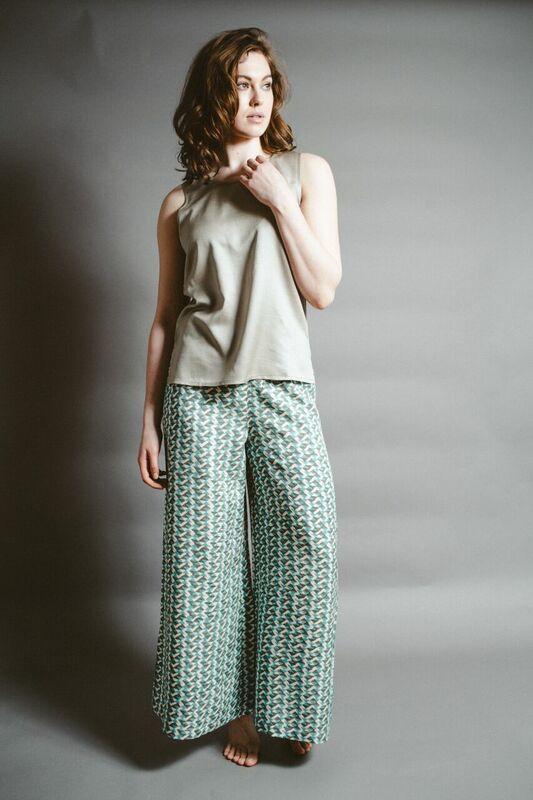 This week, we meet The Ethical Silk Company, whose founder, Eva Power, has built the loungewear and bedding company of our dreams. We grew up with silk in the house and it was always kind of mythical. My mum would say, “It makes perfect sense to sleep on a silk scarf!” My grandmother would always have a silk scarf on her head. In her generation after they washed and dried their hair, they would always rub a silk scarf on their hair to make it smooth and shiny. As a business, it all started with my Aunt Margot bringing home silk as gifts from India. She’s been living there for the past 50 years and would come back (to Ireland) with it. And I just fell in love with the silk. How did you realize you wanted to be a designer? I’m not a trained designer and there was never really any formal realization or anything like that. I started the company purely as a side project, and I didn’t know anything about where it was going to take me. I just loved the silk, I loved working with the silk, and I knew that the silk would make the most beautiful things ever. So I started experimenting with the idea of manufacturing my own silk collection in India. It was a totally natural evolution. What motivated your commitment to sustainability in your work? Well, when I started the company in 2009 I didn’t even know there was such a thing as sustainable fashion. I just started doing my research and would keep coming across things that I knew wouldn’t work for me. I just decided if I am going to genuinely run something, I need to be able to stand by it 100%. I need to run it with my conscience. I started researching the silk, and then I watched a documentary on silk production. And I saw how in regular production they boil the silk worms alive, and I just thought that was awful. I don’t eat meat but I do eat fish. I’m not a full vegetarian or vegan or anything, but I just was curious to see if there was an alternative. Which is when I discovered ahimsa silk, or peace silk. In regular silk production, as soon as the silkworms make their cocoon during their natural lifecycle, they put them all into boiling water. The workers just unravel the cocoon while the worms boil. Out of each cocoon, they get one continuous thread that is very fine and maybe 500 meters long. With ahimsa silk production, they wait until the silkworm goes through its metamorphosis and turns into a moth, then pierces a hole into its cocoon and leaves. By piercing that hole, the silkworm breaks the continuous thread. So, with ahimsa silk, they get much shorter threads. To get a continuous thread, they need to spin all of these shorter threads together. They don’t get as high a yield per cocoon, but it’s a softer yarn (which then gets woven into the silk fabric). Another thing is that ahimsa silk doesn’t have as much of a sheen to it as regular silk—it’s like a matte luster. It’s nearly like a really fine linen. What makes the Ethical Silk Company a sustainable brand? Silk itself is a sustainable fabric that is eco-friendly in its production. To begin with, the silkworms are fed on mulberry leaves so trees are not cut in order to yield the feed. Water is used in the production process to degum the silk, but nothing like the amount of water used to produce cotton. During the printing and dyeing of the silk, we use azo-free, non toxic dyes and all of the water emitted is treated and recycled for minimum environmental impact. 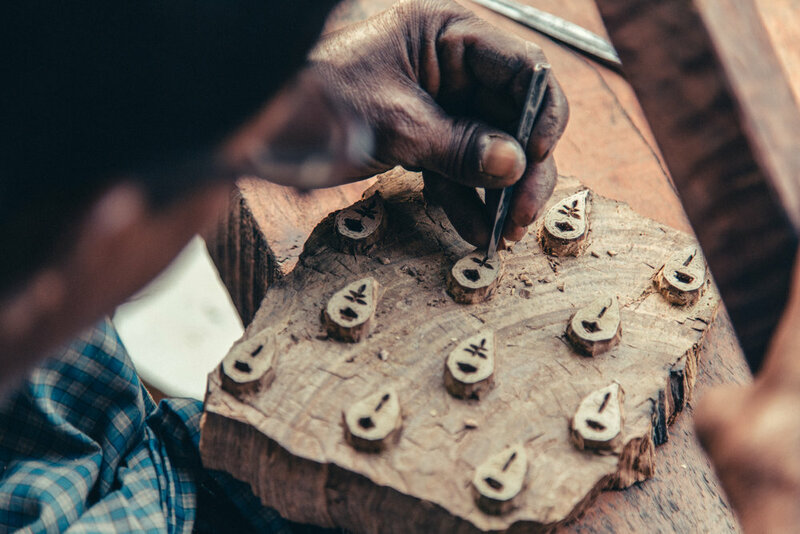 All of our products are cut and sewn in a Fairtrade tailoring unit where Fairtrade standards apply. I personally visit any unit we work with to meet the workers and inspect the conditions. Our US orders are shipped via FedEx, which allows us to use Fedex’s carbon neutral envelopes for most of them. Our worldwide orders are shipped using 100% recyclable envelopes. 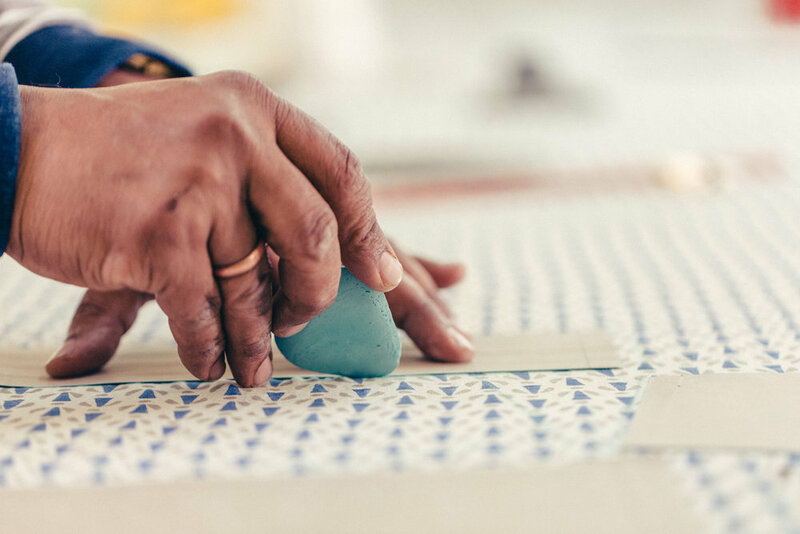 What has the journey been like to manufacture responsibly in India? It’s been a joy and a struggle. Probably my single biggest challenge in the last few years has been getting my supply chain in India sorted. I work with two companies: one to manufacture the silk, and the other for the cut and sew. And we work almost exclusively remotely. I have young kids as well so for the last couple of years, it’s been difficult to get away. So building the trust and making sure the communication is strong is key because I can’t physically be there. I’ve worked with the same silk manufacturer all along. We’ve adjusted a lot along the way, but he’s just a lovely man and we’re both on the same page. 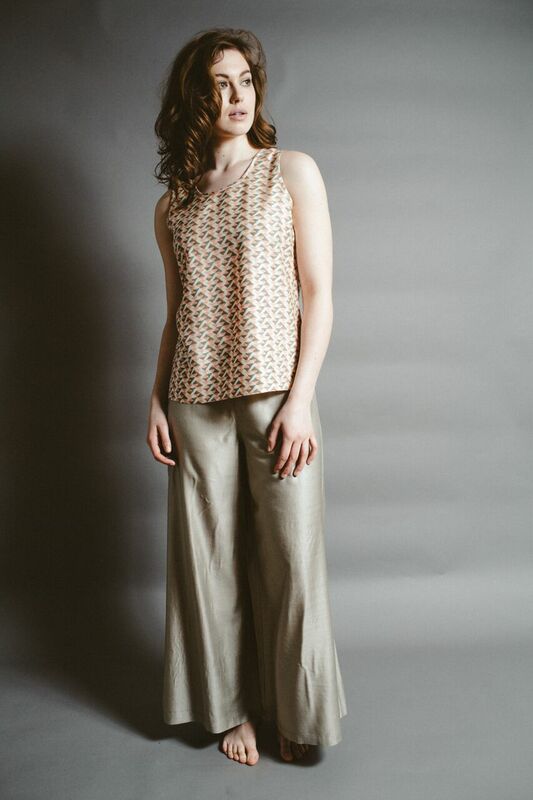 For the tailoring, I initially worked with a group that was part of a Women’s Federation. The main lady I worked with there, Sudha, was brilliant. And actually what happened is, through making our products, she saved enough to open her own tailoring shop in Theni and now employs some of the ladies from the tailoring unit. They got so busy with local business that they couldn’t keep up with the growing demand for our silk products. This was just the ultimate thing for me. She has two kids and I think she’s a single mother—the sole provider for her family. Now she has her own business and she employs other ladies. It’s fantastic. So I started looking for other tailoring units, and it was a lot of adjustment, but I ended up finding this wonderful outfit in Jaipur, run by a woman named Shari, who I love. We are in contact all the time and she’s totally on board with my vision for the quality—that’s the most important thing to me. I want to make things that people will have for years to come. Something that lasts and lasts, and I feel I’m getting that now from a quality perspective. Shari’s also become like a mentor to me. I’m not sure if she sees it that way, but I learn so much from her. The working relationship is so important to me. I love how they work. They really appreciate the quality and value of the silk so they take great care during the production. They’re constantly trying to minimize waste and find things to do with fabric scraps so they don’t just end up in landfill. You’re quite an atypical brand, in fact perhaps you’re the brand of the future, in that 100% of your business is done directly with the consumer. How did you land on this model? I’ve always sold online direct to consumer through my e-shop. I made a call at the very beginning that I wanted the silk to be luxurious but accessible. And the only way to really do that was to sell it directly without the retail markup, which doubles the price. So I can invest in really beautiful silk and high quality tailoring and maybe it costs $220, so it’s expensive, but a little bit more accessible than it would be at $450 retail. And the price my customer pays is for a higher quality item rather than a retail markup. Another thing that is really important to be is being close to my customer. I always felt like if I sold in the shops, I’d be another step away. If someone buys something from my shop online, they deal with me. I do a fair in Dublin every Christmas that I’ve done since I began. It’s lovely because I actually get to meet my customers then. And then because I came to this business without any experience—I’m not trained in fashion or business—I wanted to be in control of the speed and size of my growth. For my peace of mind, I needed to feel like I could control every aspect of my growth and I could grow on my own terms. Controlling my point of sale has been a really great way to do that. And it’s also helped me grow my confidence. Tell me about sleeping on a silk pillow case. Well, it’s really good for your hair and skin. Silk doesn’t conduct static electricity so it reduces hair breakage. I find that I don’t have to wash my hair as often when I sleep on silk at night. And then it’s also really good for your skin. It’s a natural protein fiber with amino acids which are really good for rejuvenating your skin cells. It also doesn’t draw moisture away from your skin and your hair the way cotton does so any night cream you wear is absorbed into your skin and not the pillowcase. Another good about sleeping on silk is that it’s a natural temperature regulator. If you’re prone to perspiring at night, it can be a huge relief to switch your sheets to silk. It works the other way, too. Apparently pilots in the Second World War, when they used to fly in those open aircraft, would always wear a silk headscarf when they were flying because it was so warming and so light weight as well. What have been some of the most rewarding aspects of the work you do and what have been the most challenging? The most rewarding thing is that I have loads of return customers. They love the product. They trust the quality. They’ve had a great experience, and they come back. That’s been so nice. Another thing is the working relationships I’ve built in India. 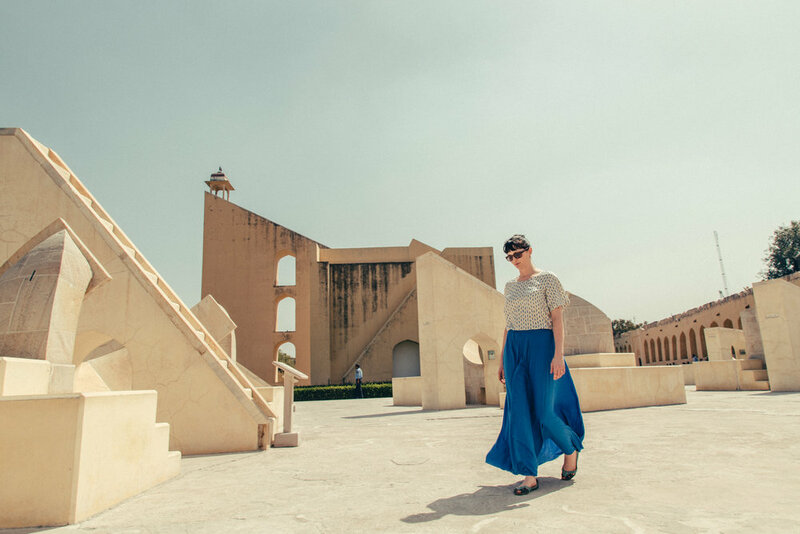 I just came back from a trip to Jaipur and it’s amazing to see that the work we’re doing together is helping grow a wonderful business there that has such a strong ethos, and directly impacts the livelihood of a lot of people. I’m also rewarded by the fact that we give a percentage of the company’s profits to charity each year. It’s small at the moment, but growing, and I want it to keep doing so. We’ve donated to Focus Ireland, which helps tackle homelessness here. We’ve donated to an AIDS center in India and they do amazing work with no money at all. So I know the money is going to good places. And I’m proud of it. I’m proud of the whole business and how it’s grown. It’s all been so rewarding honestly. What do you think about the role consumption plays in our modern relationship with fashion? The whole fast fashion phenomenon is upsetting. When a top costs 5 Euros, there’s a reason it’s so cheap. And a lot of times, people are buying something just for the sake of buying it. Where if it’s something you really love, you’re going to enjoy it for years. In some respects, people are disconnected from what they buy and where it’s made and how people are treated who make the clothes. And I think if people knew, maybe they’d act differently. I’ll hear young ladies, especially teenagers, saying they just need a top for tonight because they have nothing to wear. And I’m thinking, gosh, really no clothes? Over the last few years, just with the exponential growth of the internet and social media, there is definitely a shift going on. Companies are being held a bit more accountable. Smaller companies are introducing sustainable alternatives, and I just think that’s amazing. What is your personal approach to getting dressed? I don’t shop much. I have clothing from 15 years ago that’s my own and I took some from my grandmother that’s amazing. It has lasted for 50 years and still looks great. When I do shop, I invest in the materials. I love 100% wool and 100% silk. I absolutely love finding that amazing second-hand piece that’s 100% silk and made in France. Pure wool and Merino wool are my favorites, and my favorite wool cardigan is probably 10 years old and still looks perfect. I probably spend more on the pieces I buy, say compared to my friends, but certainly don’t shop as much. I think paying attention to the quality of the materials saves you money in the long run because the pieces last and last. 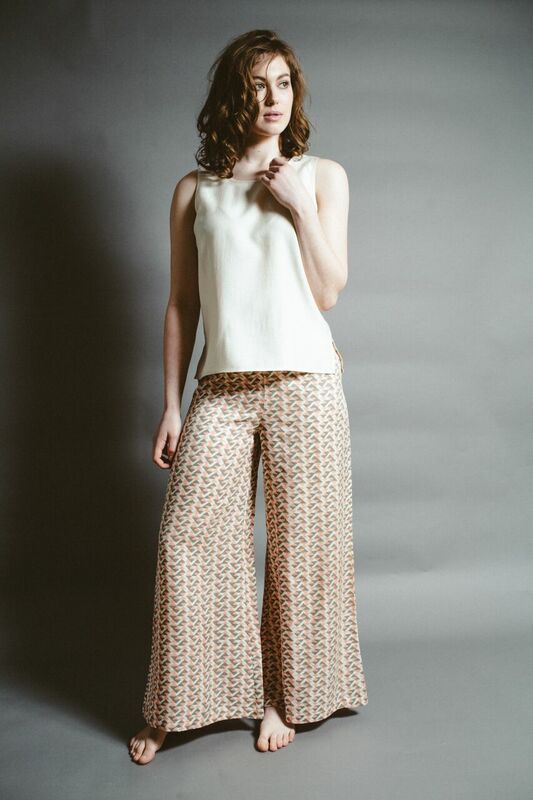 Ivory silk top and coral lounge pants. What are the things you look for as the signs of a quality garment? I look at the level of tailoring and the finish. I borrowed a dress from my sister once that she bought from a High Street chain and it wasn’t dyed properly at all- I thought “They can actually sell this?” It looked like an unfinished garment. In terms of the seams, a French seam is the best and will last the longest. It’s harder shopping online. I’ve bought things online before that look fine, and then they arrive and the fabric is awful so I send them back. So you can’t always tell at first glance but picking a piece up and inspecting the seams and finishing and looking closely at how it’s been dyed and finished and how it feels to the touch, you start to develop a sense for when something is well made. What do you perceive to be your responsibility as a sustainable designer? I work to maintain the integrity of the products I sell through the materials I use and the working conditions we ensure for the people all along the production process. My goal is to create long lasting pieces that are enjoyed for years to come. I know there are care instructions on the website, but how do you take care of your silk? Hand wash is fine but machine wash is actually better. I use a delicate cycle and a light bit of detergent. I spin it to take out the excess water, but then I iron it straight from damp. I have found that if I hang my silk things on the line, they end up stiff. I actually don’t iron anything except my silk stuff. Sleeping on the silk will be good for your hair and skin regardless of whether you iron it or not. But then there’s something so lovely about putting your head down on the end of the night on this gorgeous ironed silk pillow case. Isn’t that the definition luxury? Something commonplace that’s made extraordinary by that special touch or that extra detail? Exactly. And also it’s doing the pillow case justice. You have invested in these silk pieces. If you iron them, they’re just so wonderful. It actually enhances my mood. You can shop the Ethical Silk Company here and follow on Instagram here. Images courtesy Eva Power, The Ethical Silk Company. Feeling inspired to learn about more brands doing better? Meet Tales of Anyday and By Signe.